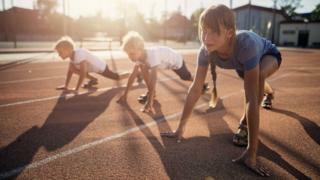 The number of schoolchildren taking part in a project to encourage sport and physical activity is at an all-time high, according to Scotland's national sports agency. SportScotland said its Active Schools initiative had seen a 5% increase in numbers over the past year. The project provides schools and sports clubs with more, and better, sporting opportunities for young people. More than seven million sessions were delivered in the past year. This was an increase of 6% over the previous year. And the number of children taking part in those sessions - before school, during lunchtime and after school - rose 5% to a record-breaking 309,000. SportScotland said the success was the result of strong local partnerships. Chairman Mel Young said: "It's really encouraging to see the continued growth in participation in Active Schools activities across the country. "The success of Active Schools is the result of strong local partnerships between Active Schools teams, school staff, sports development teams in local authorities, regional managers from the governing bodies, and local sports clubs. "By working together, we can deliver more and better opportunities for young people of all abilities to take part in sport as these latest figures show. "It is also rewarding to see the impact of programmes like Active Schools on the lives of the young people who take part, increasing their confidence and motivating them to continue an active lifestyle in the future." Sports Minister Joe FitzPatrick told BBC Radio's Good Morning Scotland programme: "Across Europe, physical inactivity is increasing so we're really pleased that we appear to stemming that trend here in Scotland. But we absolutely know we have a lot to do. "A third of young people, if they don't do anything are likely to end up being obese and while diet is a big part of that, physical activity is also a big part so we want to make sure that we are giving those young people the best possible tools to normalise an active lifestyle so that they can live the most healthy lives possible." Children across Scotland have been able to participate in more than 100 different activities ranging from football to dance and movement delivered by a combination of volunteers, including pupils, and paid individuals. An independent survey of more than 4,000 school pupils, commissioned by Sportscotland, showed that 98% of Active Schools participants felt healthier thanks to their involvement in the activities, 94% were motivated to be more active in the future and 92% felt more confident.